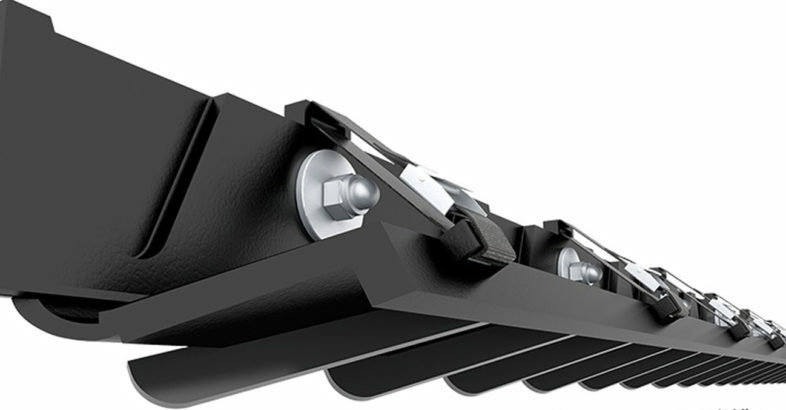 AirScrape is a newly patented German designed and manufactured conveyor belt skirting system which hovers freely above the conveyor belt, eliminating skirt friction and belt damage. Its unique array of inward facing hardened steel diagonal blades deflects larger particles inwards while it uses the airflow of the conveyor belt and conveyed material to create an inward suction, flowing any dust and fine particles back in to the product flow. AirScrape ist ein patentiertes und in Deutschland hergestelltes Seitenabdichtungssystem für Gurtförderer, das berührungsfrei über dem Fördergurt schwebt. Durch die einzigartige Anordnung der schräg angebrachten und gehärteten Lamellen, wird Luft von außerhalb in Richtung Gurtmitte geleitet. Feine Staubpartikel werden von dem Luftsog im Förderbereich gehalten. AirScrape vermindert erheblich die Verschüttung und Staubentwicklung an Übergabepunkten und anderen kritischen Bereichen in der Förderkette. AirScrape wird durch die Firma 3k solution vertreten. The first test installation is now running for 3 years. In the past they tried different sealing, but they never stopped the spillage and the dust. Now, after three years working with the AirScrape, they confirmed that all spillage and dust problems are totally solved. And without wear on the sealing, it is a running system without service, maintenance or replacing. I never knew that conveyor skirting services help reduce dust emissions which in turn reduce explosion hazards. It would seem that this piece of equipment would be really helpful in making sure your factory stays safe. It would probably be smart to check what kind of skirt system your conveyor belt needs before you get one though.